9 5/8" x 3 5/8" x 1 3/8"
Capacity per Compartment 4 oz. 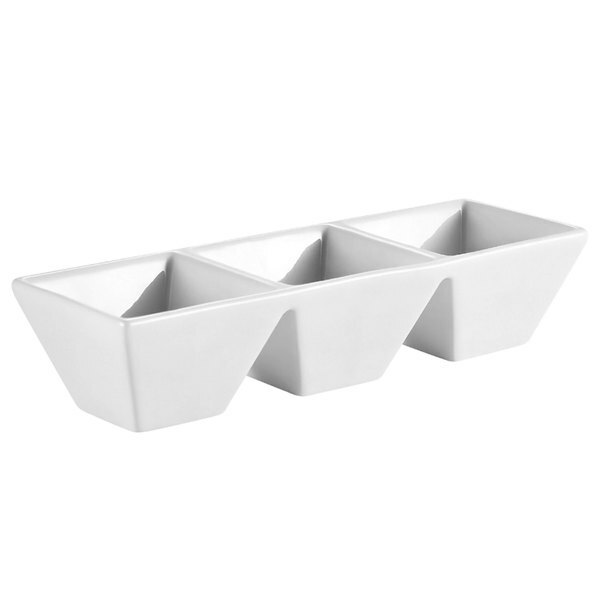 Offer your customers a tantalizing teaser of dressing or dipping sauces in these CAC CN-3T9 9 5/8" x 3 5/8" x 1 3/8" porcelain rectangular 3-compartment tasting bowls! Perfect for providing samples of various products without cluttering up your table, they will add style and functionality to any tabletop setting. Capacity (per compartment): 4 oz. It is a great useful side dish, also can be little bite food dish.The price of the dish are resonable and quality are prrety good. I like a company took care of the problem that occured on broken item and credit for more convinient. I reccommened to use this web-site store.